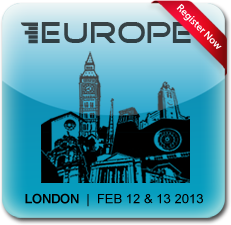 With FinovateEurope 2013 less than 2 months away, we’ve finally finished handpicking the cutting-edge companies that will be demoing their latest and greatest financial tech innovations at the conference. The selection process this year was particularly competitive due to the tremendous amount of innovation going in Europe right now. Fortunately, with our expanded two-day format, we’re excited to be able to showcase significantly more innovations this year. Before you head off for the holiday break, check out the small sneak peek below of the companies that we’ve selected. And we’ll be announcing a number of additional innovative presenting companies that are currently in “stealth mode” closer to the event. the discounted price of £1,095.00 (£100 off). Tickets are limited so please lock in your seat today to guarantee your ability to attend (and these savings). We’ll see you in London in February!